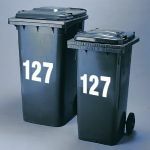 WHEELIE BIN NUMBERS STICKERS. Range of sizes and colours. From single bin numbers to packs of 10 or more. 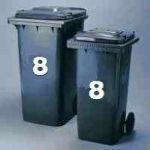 Used on all types of bins, blue bins, black and green bins, waste bins, garden bins, house bins, work bins, etc.